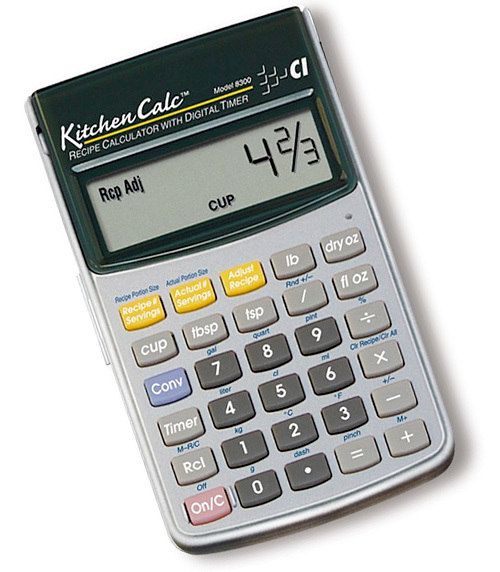 KitchenCalc Recipe Scaling Calculator With Digital Timer | OhGizmo! In the past I’ve questioned the need for a standalone calculator since these days everything from computers to phones to watches already has one built-in. But here’s one instance where I think they could still come in useful. I know the last thing I want to do when cooking is touch my iPhone or even my laptop with dirty fingers, but a cheap, $24.95 calculator? Particularly one that can be used to scale recipes for servings and portion numbers, convert cooking volume units, weights, temperatures and even run a count up or down timer at the same time? I’m sold! Replacing it should it get covered in foodstuffs won’t break the bank, but since it even includes a soft clear vinyl cover so it won’t get clogged up with ingredients, you probably won’t ever have to worry about that. And if you were wondering, the KitchenCalc can also be used as a regular calculator outside of the kitchen, but only if you want your gadget-obsessed friends looking down on you. This would be perfect for when you double recipes or split it. I hate figuring out how many teaspoons are in a tablespoon and such.